Pop Up Portland 2015 in Tokyo is in full swing! The weeklong event is part of a business development mission organized by the Portland Development Commission for Athletic and Outdoor (A&O), maker, and design companies. The purpose of the mission is to increase trade opportunities for Portland and Oregon companies. Participating companies meet with distributors, retailers, media, and consumers in the hopes of securing trade deals and increasing brand awareness in the Japanese marketplace. The Pop Up Portland Spotlight introduces each of the participating companies, their founders, and their experiences so far. What is unique about your products/company? Archival was founded with the goal of creating best quality, made in USA, bags and apparel inspired by historical examples. All of our products are made to be simple, durable, and functional. Material components are chosen for their historical accuracy, aesthetic appeal, durability, ease of repair and minimal environmental impact. The products reconcile the cost of domestic manufacturing with a high level of quality by being austerely designed, taking advantage of efficiencies throughout the manufacturing process. Archival creates heritage inspired bags and apparel for active daily use. Archival brings back products that disappeared from the market or fill in the historical blanks by taking heavy inspiration for the creation of a new design. We look for classic designs and update them for modern use. Our Archival Rucksack, for example, is an updated interpretation of a traditional canoe pack. Is this your first time to Japan? This is my second trip to Japan. I first visited in 2001. What did you do to get ready for this trip? I started Google mapping all of the Tokyo shops that I wanted to visit – Nepenthes, Nigel Cabourn Army Gym, Beams Boy, Journal Standard, Tokyu Hands, MAPS, etc. Next, we started reaching out to our many Japanese contacts: bloggers, stockists and friends abroad. We have been selling in Japan through Journal Standad and ABC Mart and Barley Harvest Season for almost as long as we have been in business. Tokyo is a kind of homeland for the Archival brand. What about Tokyo do you find the most inspiring? Early inspiration for the Archival blog – and brand – were Tokyo web shops featuring made in USA products that were better made, and more stylish and historically accurate than versions on offer in the US. 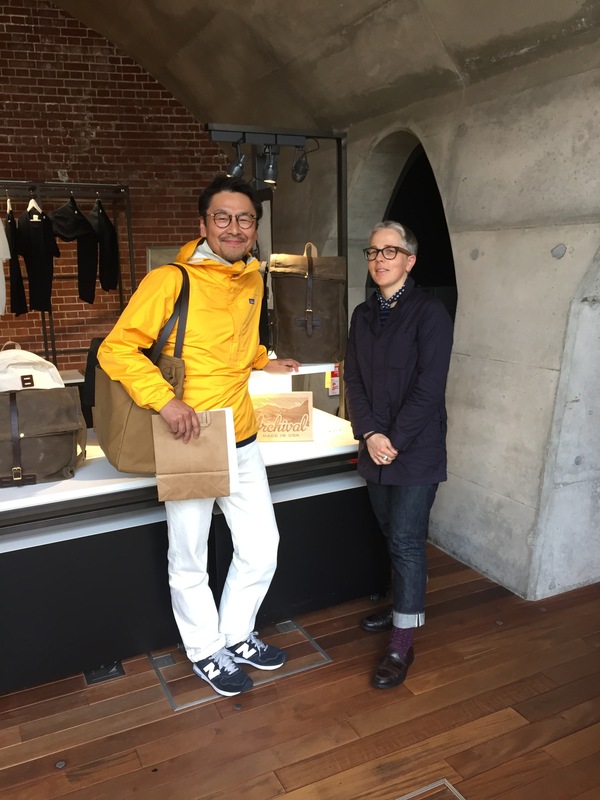 Tokyo consumers are deeply knowledgeable and have very high standards when it comes to outdoor clothing and bags. They respect traditional manufacturing practices and love venerable US clothing brands (like LL Bean, Abercrombie and Fitch and Filson) but still dress in modern, truly inventive ways (combining layers, patterns, fabrics, styles and brands in a way that is utterly unique to Tokyo). What is the coolest thing you’ve seen in the city so far? The collective high style of Tokyo’s citizens, especially in Harajuku. How does the business culture differ from Portland’s? How is it the same? Made in USA is very important to the Japanese customer. Further, Japanese customers really educate themselves about the brand history and manufacturing practices behind the products they buy. I don’t think the US customer is quite as discerning when shopping for bags or jeans or shoes. They may like a brand or a style but I don’t think their investment in the purchase goes as deep as that of their Japanese counterpart (where there is a deep connection between shopping and the culture of nostalgia). In terms of Japanese store buyers or distributors – many demand exclusive versions of a product for the Japanese market – something made in a special fabric or featuring a design element that is unique to their store. They also have much higher quality control standards than their US equivalents. Why do you think Portland has such popularity in Japan right now? It doesn’t feel new to me. I’ve been watching the conversation between Tokyo and the Northwest in the way of clothing culture on blogs and on display in Tokyo web shops since the 1990s. Tokyo has always embraced northwest style (workwear and/or lumberjack style exemplified by clothing brands like Filson, White’s Boots, Centralia Knitting Mills, etc). I think the more general “northwest” focus has now distillated down into the specific brand of “Portland.” Portland represents a niche version of a more general Northwest lifestyle (embracing craft culture, local food and beverage traditions and an underlying nostalgia for a simpler, more rustic, less technology driven lifestyle). What are you hoping to achieve on this trade mission? Reconnect with Archival stockists, brand fans and potential new sales agents. I also want to visit many of the web shops I have only know from the internet (Nepenthes, Nigel Cabourn, Journal Standard, Beams Boys, etc). In some ways, this is a homecoming for me as Archival is deeply inspired by Japanese clothing culture and manufacturing traditions.